Dr. Mark Roberts provides routine and preventative dentistry, restorative dentistry, and cosmetic dentistry for patients ages six and up in the comfort of his state-of-the-art dental practice in Athens, TX. He is a member of the American Dental Association and the Texas Dental Association, where he has held leadership positions that have improved standards of care for patients statewide. Dr. Roberts completed dental school at the University of Texas in Houston, entering a second career after spending nearly a dozen years in the oil industry working on an offshore production platform. His broad background and range of experiences help him to relate to people from all walks of life. Patients regularly comment on his positive attitude and good natured approach to patient care. 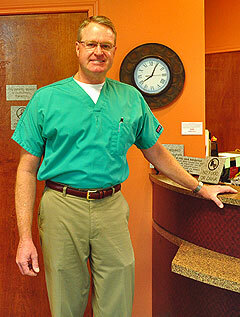 After being in practice in Athens since 2000, in 2005 Dr. Roberts opened his own Athens dental office to serve children, adolescents, teens, and adults of all ages. Through a combination of education, individualized treatment programs, and services ranging from routine cleanings to cosmetic and restorative procedures, Dr. Roberts works hard to enhance every smile, one patient at a time.